Shares of retail foreign exchange and CFDs brokers and spread betting providers are taking it on the chin this morning – the Financial Conduct Authority (FCA) announced that it is limiting leverage for retail traders to 1:50 and to 1:25 for novice clients that have less than 12 months of experience trading the markets. Plus500 shares have shed close to 40 percent at the open, while CMC Markets and IG Group were lower by over 20 percent at the time of the opening of the London Stock Exchange. As of the time of publication, CMC Markets was trading lower by 28 percent, IG Group was down 27 percent and Plus500 shares were lower by 27 percent. Shares of Playtech, a company that is primarily focused on the gaming industry, have traded lower by about 5 percent at the open and are currently trading down 4.3 percent. The firm recently announced that it intends to acquire one of the biggest institutional liquidity providers in the industry, CFH Clearing. The UK regulator is likely to serve as a model for the rest of the regulatory space across Europe. 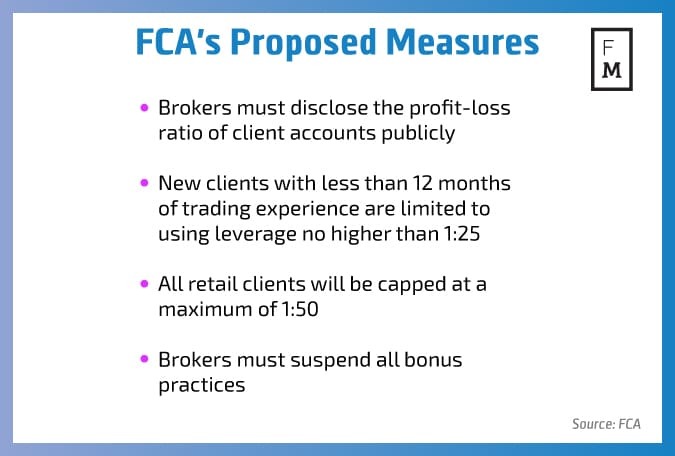 While CySEC has mandated a 1:50 default leverage only for clients that do not explicitly demand higher levels, the FCA is mandating a 1:25 cap for broker customers that have less than 12 months of experience in trading rolling spot forex, CFDs and spread betting products. According to the FCA Handbook, a retail client is a client who is not a professional client or an eligible counterparty. The regulator’s proposal for changes divides retail clients into two groups – ‘inexperienced’ or ‘experienced’ depending on the amount of experience they have trading CFDs or similar leveraged products. With 82 percent of clients losing money when trading, the results are not different across other European jurisdictions. Recently France created the legislative framework to limit the advertisement capabilities of companies that are providing foreign exchange and CFDs trading to French residents. With Belgium outright banning the product and the Netherlands aiming to draft a ban on advertising, the latest move from the FCA is an expected development. I do agree that a hard cap may be overstepping their bounds. why punish all retail traders? If they are experienced, why should they still have their hands tied? Essentially, ESMA Q&A are being implemented across EU jurisdictions. This should not surprise anyone (other than the leverage cap, which is not a requirement).